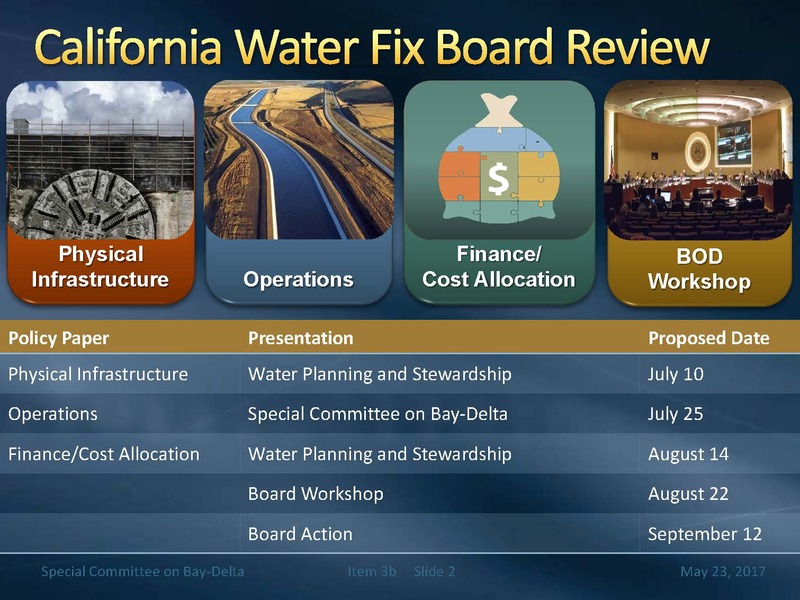 At the May meeting of Metropolitan’s Special Committee on the Bay-Delta, the pending Delta Plan amendments were discussed, as well as a brief update on the California Water Fix. But first, the meeting started as most do with an invitation for the public to address the Committee. Usually, there isn’t anyone wishing to address the Committee, but on this day, there were two speakers. “I’m here to speak briefly here with you today regarding the Delta Stewardship Council’s effort to move forward amending the Delta Plan to promote dual conveyance. Now that you’re a landowner in the Delta, I believe that you should consider that the Delta Stewardship Council has really made no progress in planning for the restoration of the Delta estuary as they are mandated to do under the Delta Reform Act of 2009. There are no amendments or plans being presented by their staff to protect the Delta as a place of historical, cultural, economic, and environmental importance. In fact, they have never considered in 8 years how the proposed Delta tunnels will impact the Delta as a place as mandated under the law, let alone the impacts on the environmental justice communities that reside in the Delta region. Consequently, if the Delta Stewardship Council approves the present amendment, they will not be enacting the coequal goals as mandated by the 2009 Reform Act and they will be moving forward with the politics of extraction in the Delta. Perhaps that does not matter to this body, but for years, I have heard you report to your fellow board members and discuss among each other that you believe investments in the Delta will improve the estuary. So perhaps now as one of the larger Delta landowners, you’re concerned about the communities surrounding your sizeable investment and recognize that the coequal goals must be met. “I come before you today, a humble resident of Long Beach, California, to give voice to my distress and misgivings regarding the proposed water tunnels project. The need to secure and effectively manage a reliable supply of water is as old as civilization itself. A healthy water system serves as the life’s blood for a thriving metropolis. We’re confronted with formidable challenges involving nature, politics, economics, and of course population growth, humans have overcome such obstacles by adapting to changing conditions and by harnessing the power of collective human knowledge, ingenuity, and will. Now our current situation, the direness of which has been terrifyingly exacerbated by the crisis we face due to the alarming and seemingly unstoppable rate of climate change, should force us all to be especially circumspect when deliberating upon this important decision. Given the circumstances, we must take stock of our priorities and put them in order. With public comment thus completed, the Committee began its regular business. Steve Arakawa updated the Committee members on the proceedings and activities of the Delta Stewardship Council as it works to update the Delta Plan. 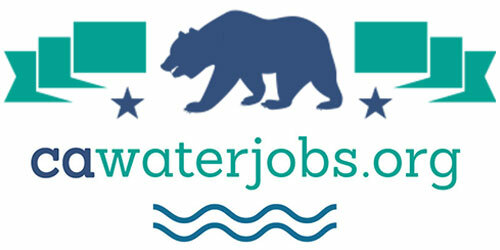 The 2009 Delta Reform Act established the coequal goals for a reliable water system for California related to the Delta and while protecting, restoring, and enhancing the Delta ecosystem; it also established that these coequal goals would be furthered in a manner that protects the unique values of the Delta as an evolving place. The Delta Reform Act established the Delta Stewardship Council and charged it with developing a Delta Plan that is consistent with the coequal goals. The Delta Plan was adopted in 2013; it resulted in 14 regulatory policies and 73 recommendations areas that include governance, water supply reliability, and ecosystem restoration. There are 14 policies in the Delta Plan. Any state or local agency proposing actions in the Delta would need to certify that whatever action that is, it is consistent with the Delta Plan and the applicable policies. Anyone could then appeal that certification, including the Stewardship Council itself. The Stewardship Council would uphold certification if there’s substantial evidence that supports the consistency of that action with the Delta Plan; if the Stewardship Council determines that there is not substantial evidence to support that consistency, then it would remand that action back to the agency and then the agency would determine what to do next. If the agency goes forward with the action, they would submit a revised certification based on whatever modifications they make, and then again, anyone could appeal under the Stewardship Council procedures. The Delta Plan has been amended already since it was adopted; there were amendments adopted in February of 2016, and single year transfers were exempted from the covered actions process in September of 2016. The Council is working on three amendments. The first amendment is for the Delta Levee Investment Strategy, another charge under the 2009 Delta Reform Act. The draft was approved for moving forward with the environmental impact report in February of 2017. The second amendment addresses guidelines for conveyance, storage, and the operations of both; the third amendment addresses performance measures. 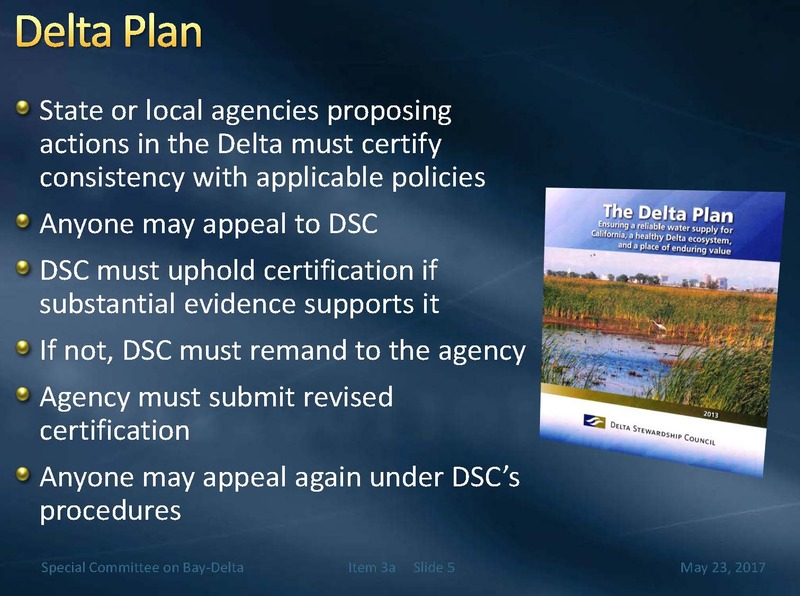 With respect to the conveyance, storage, and operations amendment, the 2009 Delta Reform Act mandated that if the Bay Delta Conservation Plan was deemed to meet the requirements for a Natural Communities Conservation Plan, that it would become part of the Delta Plan. 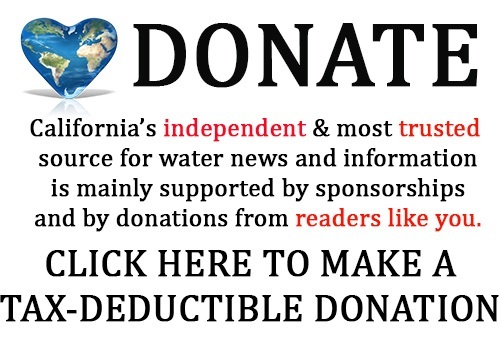 “Since then, the state moved away from the Bay Delta Conservation Plan to the California Water Fix, so certainly we have an interest in making sure that the Delta Plan is updated in a manner that would provide for alternatives that are consistent with dual conveyance being included in their update to the Delta Plan and the EIR,” said Mr. Arakawa. The Delta Stewardship Council has been working on the amendment language at its monthly meetings since February. They will be reviewing the draft amendments for both the performance measures and for conveyance, storage, and operations at their upcoming meeting on Thursday. Mr. Arakawa said the purpose of the conveyance, storage, and operations amendment is to provide for options for new and improved conveyance including dual conveyance, to provide for how new and expanded storage could address climate change and provide ecosystem and water supply benefits, and to also call for the increased integration of operations of these facilities to make sure that they are all working in tandem and contributing to the coequal goals. The performance measures provide the Council with a way of tracking progress as actions are taken and progress is monitored to make sure the objectives of the Delta Plan are being met and to allow the Council to see how that’s working and determine if any changes are needed. The purpose of the performance measures include some way of measuring the trends and status of the various areas that they are monitoring for the health of the Delta, he said. Regarding the performance measures, Mr. Arakawa said that Metropolitan’s interest is to make sure there is meaningful and relevant measurement as it relates to the Delta Plan goals so that progress can be tracked in a way that is related to meaningful ways of determining how things are working. He then turned the floor over to Margie Wheeler, who then discussed how Metropolitan has been working with the State Water Contractors in commenting on the Delta Plan amendments. “Metropolitan and the State Water Contractors have been working collaboratively to review the Delta Plan amendments, and we generally agree that the status quo is not acceptable in the Delta and if nothing is done, conditions will continue to decline as they have been,” began Margie Wheeler. She also noted though that while there is general agreement that the amendments are moving in the right direction, they continue to work with the State Water Contractors and the Council on some further refinements. 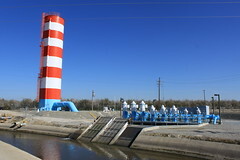 Ms.Wheeler noted that the most recent draft of the conveyance amendment outlines 50 years of work that has been done by state, local, and federal organizations that has led to the understanding that new conveyance in the Delta should include a combination of isolated conveyance facilities with new intakes and through Delta conveyance. Dual conveyance would provide flexibility to manage for fish needs and allow for delivery for water in a way that has a lesser effect on fishes and more fish friendly flow patterns, she said. “We agree that dual conveyance is the best option to address the multiple uses and conditions in the Delta watershed and provide adaptability to prepare for future changes and challenges evolving in the ecosystem as it experiences climate change in the future,” she said. Performance measure 6.2 as written includes a Fall X2 calculation to meet the state board’s salinity objective, but it does not reflect the scientific uncertainty associated with the benefit of required flow management actions necessary to meet those standards, she said. Metropolitan has provided written comments on the performance measures, and last week, 16 member agencies signed on to a letter and others are considering submitting their own. The updated draft amendments will be discussed at the Thursday Council meeting. Once the language is approved, it will then go through the environmental review or CEQA process. As the amendments work through the process, there will be continued opportunities to review and provide comments. The Council is tentatively scheduled to take action on the draft amendments at its June meeting. 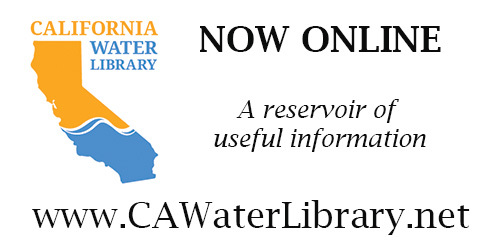 Mr. Arakawa then provided a brief update on the California Water Fix proceedings and how Metropolitan staff is planning to present the information to the Board for a decision. The biological opinions for the salmon and Delta smelt are expected to be completed and finalized by June 9th. The state and federal agencies will then make a determination on the environmental documents likely around the end of June, and then a week after that, the state’s permit for longfin smelt, a state-listed species, would be issued. There have also been an increased intensity of meetings in Sacramento on the allocation of costs for the project. Metropolitan staff is preparing three white papers: one discussing the physical infrastructure; a second discussing operations and project yield or range of supply; and a third on finance and cost allocation. The white papers will be provided in three separate meetings tentatively scheduled for July and early August; that would be followed by a board workshop for overall deliberation in late August. The Metropolitan Board of Directors could potentially take action on September 12. “These papers would describe each of the issues in the relevant areas, but also it would deal with areas of risk, and what are the risk management actions that would be involved in order to deal with those kinds of risks, so by the time that the board gets to the workshop, they’d be able to talk about what is being presented at each of those three areas as an integrated comprehensive look at the proposed project,” said Mr. Arakawa. During the discussion period, Director Fern Steiner noted that the proposed timeline doesn’t leave much time for the directors to discuss the project with their own agencies, so more time might be needed for those discussions to occur. She also asked if the cost allocation discussions are still along the lines of how much water or allocation being the determining factor for cost allocation of the project. Mr. Arakawa confirmed that the allocation approach being talked about amongst the State Water Project contractors is consistent with cost and water benefit being provided and specifically the table A contract approach as far as how those costs will be apportioned. Director Steiner asked about discussions about if agencies choose to opt out. “On the State Water Project side, there are discussions going on about the existing provisions that are in the existing contract about how contract amount could be transferred between contractors, and how that might work in order to make things work for all the contractors for this cost allocation, and then on the CVP side, I think they are talking about what it means if you’re not investing versus investing, but we’re not in those meetings so we’ll have to see what they actually present when it comes time,” said Mr. Arakawa. “We did talk about the possibility of someone saying, ‘I have rights on the dual conveyance side of this, and so I’m going to take all my water that way,’ and I know there were discussions that that’s simply not going to be how it’s going to work,” said Director Steiner. To view the agenda, meeting materials, and webcast for this meeting, click here.